This story was updated at 10:16 p.m. ET. SEATTLE — Astronomers announced the discovery today (Jan. 10) of the first "unquestionably rocky" alien world — a planet called Kepler-10b. Scientists have announced other rocky exoplanets in the past, but Kepler-10b earns its title, researchers said, because they're sure of its composition. And that's because they know its host star so well. In fact, the Kepler-10 star is one of the most well-characterized planet-hosting stars in the universe. Once researchers first picked up Kepler-10b's signal, back in 2009, they trained the Kepler Space Telescope on its parent star, located about 560 light-years from Earth. Scientists took extremely detailed measurements of the star's brightness oscillations, using this information to probe its interior, in much the same way that geologists use earthquakes to study Earth's interior. This method, called asteroseismology, allows researchers to learn a great deal about a star's structure, including its size. Once the scientists had this information in hand, they used it to deduce how big, and how dense, Kepler-10b was. Researchers now know the properties of the parent star within 2 to 6 percent, Natalie Batalha, leader of the study announcing the new planet's discovery, told reporters here today at the winter meeting of the American Astronomical Society. "We know what this star is," Batalha said. Batalha and her colleagues made their discovery using NASA's Kepler Space Telescope, whose primary mission is to hunt down potentially habitable Earth-like planets in our galaxy. Kepler finds alien planets that pass in front of their host stars, picking up on the tiny brightness dips that occur when such "transits" take place. The magnitude of those brightness dips — in Kepler-10b's case, it was a drop of 0.015 percent, Batalha said — tells researchers how big the planet is, relative to its parent star. Measurements made by the Keck Telescope in Hawaii determined how much the newly discovered planet tugged on its star, making it wobble. These observations yielded the planet's mass — again, relative to the parent star. If a planet's mass and volume are known, it's a simple step to calculate its density, which tells researchers the likely composition (rocky, gaseous, icy, etc.). But to do this for the hellishly hot Kepler-10b, Batalha and her colleagues needed to convert relative mass and density into absolutes. And that's where Kepler's asteroseismology observations came in. Since the team got such a detailed and accurate look at the star, they feel confident that they're getting Kepler-10b's density correct. The researchers calculated the density of Kepler-10b at 8.8 grams per cubic centimeter, which places it squarely in the "rocky" category, just like Earth. "Kepler-10b is the smallest exoplanet discovered to date, and the first unquestionably rocky planet orbiting a star outside our solar system," Batalha said. "The composition could even be consistent with an Earth composition." Kepler-10b isn't the first exoplanet scientists have claimed is rocky. 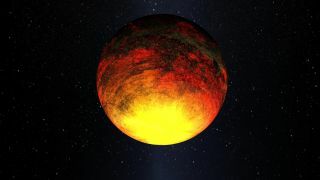 In 2009, for example, a different research team announced that the smallish, scorched alien world Corot-7b is rocky as well. When asked about Corot-7b, Batalha didn't claim that it wasn’t rocky. But, she did say that there's enough uncertainty in the measurements to leave some doubt — hence Kepler-10b's status as the first "unquestionably rocky" alien planet ever found. "Corot-7b was indeed a very important discovery," Batalha said. It could turn out to be rocky, she added, but it's difficult to say for sure at the moment. "It's a tough one."